An image can be integrated here. This will be shown to the left of the category in the Pinboard portlet. Opens a dialog where an image can be selected or uploaded. Opens a dialog where the text can be entered. This will be displayed as an alternative to the picture, if the end device is not capapable of displaying images. Defines how many entries should be shown in this category when the portlet is loaded. 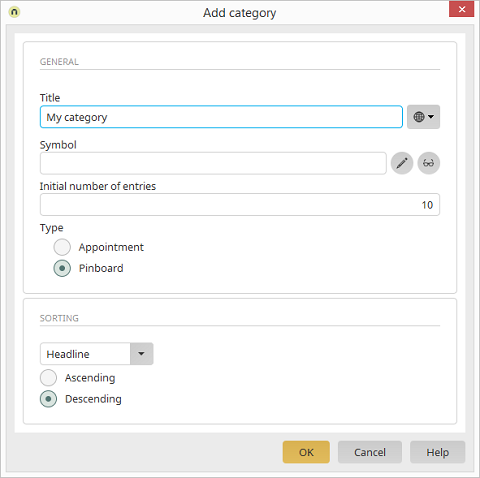 Entries made in a category with this type will be shown on the "Appointments" tab in the Pinboard portlet. Entries made in a category with this type will be shown on the "Pinboard" tab in the Pinboard portlet. according to the settings that you have made in the pinboard configuration. Entries are shown in ascending order. Entries are shown in descending order.